Wonderstruck is a 2017 American mystery drama film directed by Todd Haynes and based on the 2011 novel Wonderstruck by Brian Selznick, who also adapted the novel into a screenplay. The film stars Oakes Fegley, Julianne Moore, Michelle Williams, and Millicent Simmonds. The film premiered at the 2017 Cannes Film Festival on May 18, 2017, and competed for the Palme d'Or. It was given a limited release in the United States by Amazon Studios and Roadside Attractions on October 20, 2017. The film interlaces two stories set fifty years apart, switching frequently between them, with the older storyline filmed in black and white. Each tells the story of a child's quest. In 1927, young deaf girl Rose runs away from her father's New Jersey home to find her mother/idol, the actress Lillian Mayhew. In 1977, recently orphaned Ben, made deaf by a freakish accident, runs away from his Minnesota home in search of his father. 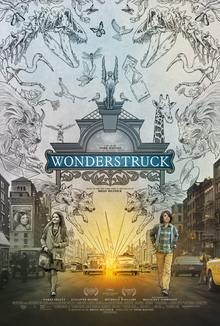 Todd Haynes directed Wonderstruck based on an adapted screenplay by Brian Selznick, who also wrote the novel of the same name. Haynes was involved as director by May 2015 with Christine Vachon producing under her Killer Films banner. Haynes said his previous films had mostly been period films and that Wonderstruck's double-period premise, set in the 1920s and the 1970s, intrigued him. The director also considered the story "a classic mystery" in learning why two stories are being told and how they would connect. He saw it as a family film and as an opportunity to make a film about children that children could also see. In November 2015, Julianne Moore had been cast in the film, with Pamela Koffler and John Sloss joining as producers. In April 2016, Jaden Michael, Cory Michael Smith, Michelle Williams, Oakes Fegley, and Amy Hargreaves joined the cast of the film. In May 2016, James Urbaniak joined the cast. Among those cast was Millicent Simmonds, a deaf actor from Utah. Haynes said they wanted to cast a deaf actor since deafness was integral to the two stories and the driving theme in the film. He instructed his casting director Laura Rosenthal to seek out deaf children around the country and if they could not find someone, they would cast a hearing child. They sought out deaf communities and received audition tapes from 200 deaf children. Simmonds was cast, and on set, she worked with American Sign Language interpreter Lynette Taylor. Principal photography began on May 4, 2016. Filming took place in Peekskill, New York. Production concluded on July 3, 2016. The 1927 scenes were filmed in black and white in 35-negative anamorphic, which differs from the aspect ratio of silent films. Haynes, who was a fan of silent film directors F.W. Murnau and King Vidor, watched numerous silent films and observed that there was a wide range of styles that disappeared when sound technology made cameras too bulky to move easily. In Wonderstruck, the black-and-white scenes have a near-continuous musical soundtrack and use some design features that Haynes said were "not naturalistic or literal". The 1977 scenes were filmed with color-negative film in a way that matched the visual language of films from the 1970s, and also had "a gritty urban color" like the films Midnight Cowboy (1969) and The French Connection (1971). Both parts were filmed by cinematographer Edward Lachman. Amazon Studios and Roadside Attractions will distribute the film. Amazon Studios partnered with Roadside to distribute Wonderstruck in the United States. It had its world premiere on May 18, 2017 at the 2017 Cannes Film Festival, where it competed for the Palme d'Or in the main competition section. It also screened at the New York Film Festival on October 7, 2017. The film began a limited release in the United States on October 20, 2017, before a wider release in mid-November 2017. Wonderstruck has grossed $1 million in the United States and Canada, and $2.2 million in other territories, for a worldwide total of $3.3 million. Wonderstruck was met with a three-minute standing ovation following its premiere at the 2017 Cannes Film Festival. On review aggregator Rotten Tomatoes, the film holds an approval rating of 66% based on 194 reviews, with an average rating of 6.6/10. The website's critical consensus reads, "Wonderstruck's efforts to juggle timelines and tonal shifts aren't always smooth, but the end result still adds up to an emotional journey whose visual thrills live up to its title." On Metacritic, the film has a weighted average score of 71 out of 100, based on 44 critics, indicating "generally favorable reviews". David Rooney of The Hollywood Reporter gave the film a positive review writing: "Alive with the magic of pictures and the mysteries of silence, this is an uncommonly grownup film about children, communication, connection and memory." David Ehrlich of IndieWire also gave the film a positive review writing: "A soul-stirring and fiercely uncynical film." ^ a b "2017 Screenings Guide" (PDF). Cannes Film Festival. Retrieved May 11, 2017. ^ a b "Wonderstruck (2017)". Box Office Mojo. IMDb. Retrieved October 12, 2018. ^ Kay, Jeremy; Wiseman, Andreas (May 18, 2015). "Todd Haynes is 'Wonderstruck'". Screen Daily. Screen International. Retrieved May 3, 2017. ^ a b c d e Kilday, Gregg (May 17, 2017). "'Wonderstruck': How Todd Haynes Shot a Double-Period Film With Child Actors and Lots of Silence (Q&A)". The Hollywood Reporter. Prometheus Global Media. Retrieved October 2, 2017. ^ a b c d Turan, Kenneth (May 19, 2017). "'Wonderstruck' director Todd Haynes reveals how he found the deaf actress so good it gave him chills". Los Angeles Times. Retrieved October 2, 2017. ^ Fleming, Mike Jr. (November 16, 2015). "Julianne Moore To Reteam With Todd Haynes On 'Wonderstruck'". Deadline Hollywood. Penske Business Media. Retrieved May 4, 2016. ^ Kroll, Justin (April 8, 2016). "Michelle Williams to Star With Julianne Moore in Todd Haynes' 'Wonderstruck'". Variety. Penske Business Media. Retrieved May 4, 2016. ^ Pedersen, Erik (April 19, 2016). "Sam Richardson & Vanessa Bayer RSVP For 'Office Christmas Party'; Jaden Michael Gets 'Wonderstruck'". Deadline Hollywood. Penske Business Media. Retrieved May 4, 2016. ^ Lincoln, Ross A. (April 21, 2016). "Cory Michael Smith Joins 'Wonderstruck'; Max Greenfield Entering 'Glass Castle'". Deadline Hollywood. Penske Business Media. Retrieved May 4, 2016. ^ Lincoln, Ross A. (April 22, 2016). "'Pete's Dragon' Star Oakes Fegley Lands Leading Role In 'Wonderstruck'; Erick Chavarria Attends 'Office Christmas Party'". Deadline Hollywood. Penske Business Media. Retrieved May 4, 2016. ^ Lincoln, Ross A. (May 17, 2016). "James Urbaniak Joins Todd Haynes' 'Wonderstruck'". Deadline Hollywood. Penske Business Media. Retrieved May 18, 2016. ^ Lincoln, Ross A. (April 21, 2016). "Deaf Performer Millicent Simmonds To Co-Star In Todd Haynes' 'Wonderstruck'". Deadline Hollywood. Penske Business Media. Retrieved May 4, 2016. ^ Coyle, Jake (May 18, 2017). "'Wonderstruck', with deaf newcomer Simmonds, lands at Cannes". Associated Press. Archived from the original on May 20, 2017. Retrieved May 20, 2017. ^ Christine (May 3, 2016). "Tuesday, May 3 Filming Locations for YDKK, Wonderstruck, A Series of Unfortunate Events, The Walking Dead, The Blacklist, & more!". On Location Vacations. Retrieved May 4, 2016. ^ Vachon, Christine [@kvpi] (May 4, 2016). "Day One of WONDERSTRUCK (here we go!!)" (Tweet). Retrieved May 4, 2016 – via Twitter. ^ SSN Insider Staff (May 6, 2016). "On the Set for 5/6/16: Taron Egerton Starts 'Kingsman' Sequel, Hugh Jackman Begins on 'Wolverine 3', Rooney Mara & Robert Redford Finish 'The Discovery'". SSN Insider. TSS News. Retrieved May 6, 2016. ^ Flores, Ricky (May 5, 2016). "Todd Haynes production of Wonderstruck being filmed in Peekskill". The Journal News. Gannett Company. Retrieved May 9, 2016. ^ Vachon, Christine [@kvpi] (July 2, 2016). "one more day!" (Tweet). Retrieved July 4, 2016 – via Twitter. ^ Sneider, Jeff (December 9, 2015). "Amazon Studios Near Deal for Todd Haynes, Julianne Moore Movie 'Wonderstruck' (Exclusive)". TheWrap. Retrieved May 4, 2016. ^ Tartaglione, Nancy; Evans, Greg (April 13, 2017). "Cannes Lineup: Todd Haynes, Sofia Coppola, Noah Baumbach, 'Twin Peaks'". Deadline Hollywood. Penske Business Media. Retrieved April 13, 2017. ^ Winfey, Graham (13 April 2017). "2017 Cannes Film Festival Announces Lineup: Todd Haynes, Sofia Coppola, 'Twin Peaks' and More". IndieWire. Penske Business Media. Retrieved 13 April 2017. ^ Fleming, Mike Jr. (July 6, 2017). "Todd Haynes-Helmed 'Wonderstruck' New York Film Festival Centerpiece Selection". Deadline Hollywood. Penske Business Media. Retrieved July 6, 2017. ^ Lang, Brent (May 3, 2017). "Todd Haynes' 'Wonderstruck' Scores Awards-Season Release From Roadside, Amazon (Exclusive)". Variety. Penske Business Media. Retrieved May 3, 2017. ^ Gardner, Chris (May 18, 2017). "Cannes: Todd Haynes' 'Wonderstruck' Gets Warm Standing Ovation". The Hollywood Reporter. Prometheus Global Media. Retrieved May 19, 2017. ^ "Wonderstruck (2017)". Rotten Tomatoes. Fandango Media. Retrieved October 12, 2018. ^ "Wonderstruck Reviews". Metacritic. CBS Interactive. Retrieved January 5, 2018. ^ Rooney, David (May 18, 2017). "Wonderstruck Film Review". The Hollywood Reporter. Prometheus Global Media. Retrieved May 19, 2017. ^ Ehrlich, David (May 18, 2017). "Cannes Review: With 'Wonderstruck,' Todd Haynes Returns With A Profoundly Moving Fable For All Ages". IndieWire. Penske Business Media. Retrieved May 19, 2017.